Sync the OASIS calendar with other email services. From the Calendar tab, select Export. 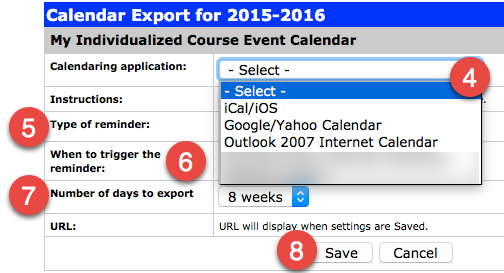 In the Export window, select the Calendaring Application you want to sync. Select a reminder type (optional). Set the reminder trigger time (optional). Set the number of days to export to 18 weeks. Note: This means that you will be able to see 18 weeks ahead on the schedule and it will update throughout the term. Once saved, the URL will appear for the calendar you selected. Copy this URL and proceed to Step II. Complete Step 1 instructions above. On the iPad go to Settings > Accounts & Passwords. From the resulting options, select Other. Paste the URL in the Server field. On the next screen, select Save. Option 2: If you are adding the URL to the iPad calendar, open OASIS in an iPad browser (Chrome or Safari) and follow Step 1 instructions. Copy the URL and Paste it into a new browser tab. Do not select Paste and Go. Change the https to webcal, then click return. When prompted to Open this page in "Calendar"? select Open. Follow any additional prompts. Log in to Gmail and view the Calendar. Paste the URL into the resulting field. Note: The Make the calendar publicly accessible option is NOT recommended. Log in to BWA and view the Calendar. Right click on My Calendar and select Open Calendar. 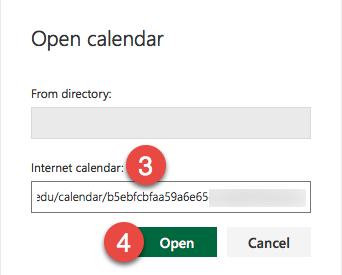 In the prompt, paste the URL derived from OASIS into the Internet Calendar field.